Lately, I have been digging deep into Windows to get really low level with the the I/O path SQL Server takes (yep, there is an even deeper layer to understand fully). Windows 8 allows kernel debugging directly over the network card, but how does one configure kernel debugging with a Windows 2008R2 target from a Mac with VM Ware? A USB converter and a NULL modem is a dirt cheap way to get the required hardware for kernel debugging. I sourced my cables from Maplins (Thanks @SQLServerMonkey) in the UK – for a total of around 20 GBP. A Macbook air, like most other lightweight laptops, does not have a serial port. So, we have to use a USB/Serial converter. It is possible to debug directly over USB, but good luck with that from a Mac, I didn’t have the courage. Now, install WinDbg and set up your symbol paths if they are not set up already. After installing the device, I had to restart my virtual machine before VMWare would let me mount it – but what can you expect from a 10 GBP component? Your mileage may vary depending on the serial/USB driver you have. 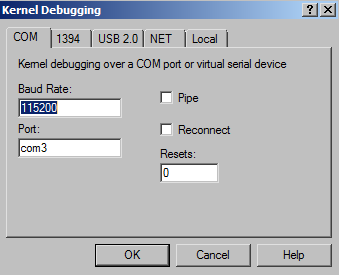 Using the NULL modem, connect the USB/Serial converter to the server’s Serial port. Make sure the server has the serial port enabled in the BIOS (my Dell box had it disabled, had to re-enable). Replace the <GUID> the guid returned previously. 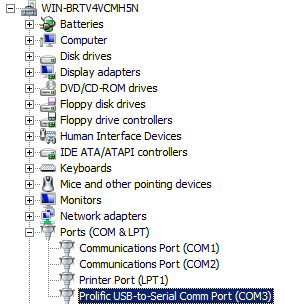 Set <port #> to the COM port the NULL modem is connected to in your server (NOT the COM port of the client). For example, if the server has the NULL modem in COM2, set <port #> to 2. If you want to make sure debugging is always turned on (great for a sandbox machines where you explore stuff in the kernel) you can use BCDEDIT /default <GUID> to make debugging the default startup option. Press OK, and reboot the server. If you didn’t select the debug configuration as the default boot option, make sure you pick it when the server starts. One thing to note when you are debugging the kernel: Not all your typical WinDbg commands work as they normally do (for some good reasons), but that is outside of scope for this blog entry. 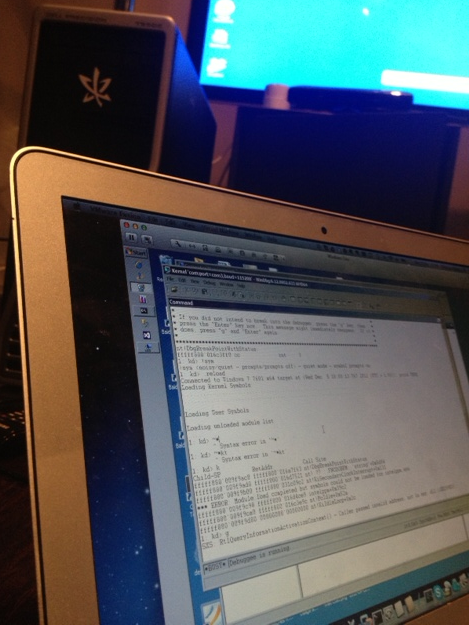 Time to dig in even deeper… my Macbook Air to a Windows box :-)…Happy hacking everyone. in your think, it`s work? For that type of configuration, I would simply use a USB debug cable. Unfortunately, I did not have one of those handy. Firewire would be even better if you could get it to work. I tried this and had limited success. Can you help me get setup. what version windbg are you using? Great information – thanks Thomas! 🙂 I assume there is also a way to do kernel mode debugging into a VM? Am I right on this? Yes, there is. You can debug from on VM to another on the same host over a named pipe. Good way to learn about the kernel without having two different machines.